One thing that I truly enjoy about the summer is outdoor plein-aire landscape painting. It gets me out of the studio and into a new environment and experience. There is time set apart for true reverie. The product becomes not the painting itself but the internal experience of dwelling in the world. I use to think landscape painting wasn’t personal enough. That it depicted so much of the visual quality of space and time with not enough of the internal experience exposed on the canvas. But recently, I have found it to be otherwise. I have always thought of my figures as a representative of an imaginative journey that takes place within the artist and these figures when viewed together represented in a concrete form the internal development of the creative individual. They linked the internal imaginative reverie with the experience of painting a live figure in the studio. And hence an image is born that straddles both worlds giving a timeless quality to figurative work. Recently, I have found a type of landscape painting that touches upon this feeling as well. When I am out in the early morning in the freshness of a new day, I find I am constantly compelled to day dream. As I set out to paint my chosen location, I find reverie an integral part of the whole experience- that my mind and heart are carried away to see what is before me and also that of which it suggests. This combined experience creates a state of being in which I feel complete and whole. There is a unity between all things that is acutely experienced in such a state. When one stands before a beautiful scene, one is apt to wonder in a state of reverie, carried away not by an “idea” but by the sheer pleasure of the observation combined with the experience of dwelling in quietude. This allows for an “open experience”- fertile ground for reverie and an active imagination in the “moment”. This living in the moment activates the mind and heart and allows the imagination to wander freely in the landscape. This free movement is a generative and renewing force. In such a state an image that is seeking form can find a lacuna in which to present itself before the artist. Ibn Arabi related this experience to an isthmus or bridge to another world where the imagination is given power and free rein. When I create images for the studio, much of my reverie comes before the actual painting process. I spend time in reverie, allowing the image to manifest itself. The “idea” behind the image guides me in the actual reverie. But this part of the experience comes prior to my actual working with the model. The image is developed through reverie and when I am painting I am trying to manifest this earlier experience more completely. I am also able to find in the model the “living” aspect of the image. It is a triad of the artist, the model and the image. This triad becomes the fertile ground for the creative act. 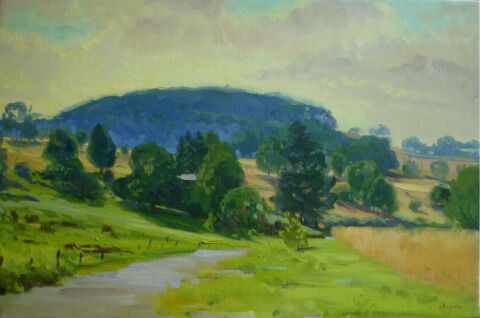 But what I enjoy about landscape painting is that there is no delay in the experience. Reverie is manifest with a sense of immediacy in the moment. It is the very moment that is seeking form. It cannot be re-experienced at a later date. Now is the time and this experience is fleeting- the day will change the clouds will move in and another time has taken possession of the moment. 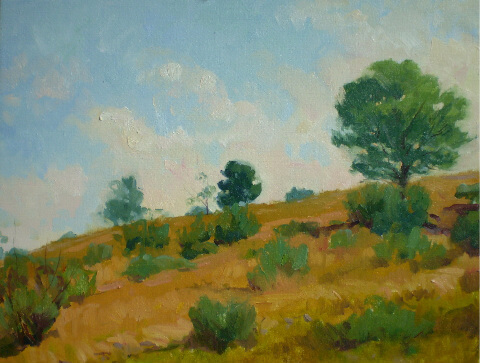 Although, I will always be a figurative painter, I find the restlessness of the landscape refreshing and renewing. Judith, looking at these paintings puts me into a reverie they are easy to get lost in.